(Gervais, 1852) from the late Eocene of the Paris Gypsum is probably also a quer-cymegapodiid (Mayr 2005a). Possibly because of its slender carpometacarpus, a plesiomorphic feature shared with gallinuloidids, the species was classified into the Rallidae (rails) by Brunet (1970) and Cracraft (1973a). The same happened to Taubacrex granívora Alvarenga, 1988 from the late Oligocene/early Miocene of the Taubaté Basin in Brazil, which was also assigned to the Rallidae in the original description (Alvarenga 1988), but was identified as a representative of the Quercymegapodiidae by Mourer-Chauviré (2000). Also from the Oligo-Miocene of the Taubaté Basin, Alvarenga (1995) described Ameripodius silvasantosi as a species of the Quercymegapodiidae. Mourer-Chauviré (2000) noted that T. granivora and A. silvasantosi differ in the shape of the coracoid, but this bone is slightly crushed in the holotype of T. granivora, and direct comparisons of the actual specimens are needed to exclude the possibility that these two species are conspecific. 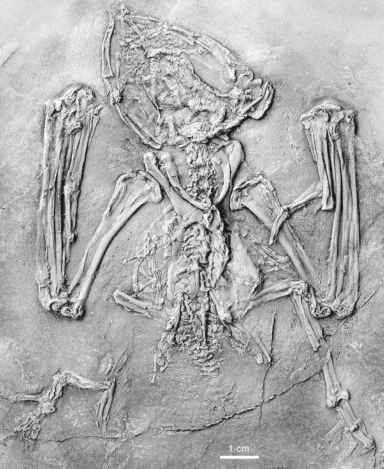 Taubacrex provides the earliest fossil record of gastroliths in galliform birds. The coracoid of quercymegapodiids still exhibits a cup-like articulation facet for the scapula. Among other features (Mourer-Chauviré 1992; Mayr 2000b), quer-cymegapodiids differ from gallinuloidids in the more robust humerus which lacks a second pneumotricipital fossa. They agree with crown group Galliformes in the derived presence of a ridge in the capital groove (incisura capitis) of the humerus, which is absent in the Gallinuloididae and Paraortygidae. Despite their name and initial comparisons with megapodes (Mourer-Chauviré 1982), quercymegapodiids are stem group representatives of the Galliformes, and the similarities to extant Megapodiidae are plesiomorphic (Mourer-Chauviré 1992a). Nevertheless, these birds were incorrectly used for the calibration of molecular divergence times in some recent studies (van Tuinen and Dyke 2004; Crowe et al. 2006; see Mayr and Weidig 2004; Mayr 2008d).